I just recently returned from a 2 day "expedition" (i.e. bug hunt) in Southern Illinois. I make one or two trips there each summer depending on my finances. I live in Northern Illinois so it takes me 6 hours to get to the locality I collect. Once settled, I start scouting out some of my usual collecting haunts which I have found to be the best of the lot that I have investigated. I do both night collecting for moths and beetles as well as day collecting for butterflies. Usually as these trips go; my night collecting ventures turn out generally far better than my day collecting. I have only had spotty "good" day collecting as the fields I visit are either in a state of having just been mowed (for hay) or are simply too overgrown to amble through without getting tangled afoot. Ticks are also a problem in weedy overgrown fields. On this occasion, I experienced two decent nights overall; although my first night was cut short a bit as some pretty stiff winds came up after midnight and ended any thoughts of further collecting. My second night was better for numbers. Southern Illinois for me has always proved good for my personal collecting efforts as it is still so heavily forested and rural throughout. Below, I will post some photo's of some of the nice things that I happened across during my 2 day stay. Another item which got my attention was only starting to make it's appearance. This lovely species usually begins emerging around the last week of June (down there) and continues it's long emergence cycle through the end of July (with peak periods during the 2nd and 3rd weeks of July). I managed to get 1 female and 2 males. Females are especially nice to find as they are never seen or found in the numbers that the males are. Having only found about 10 females over the years I was quite elated to add another to the small "harem" in my collection. In comparison, I have probably collected between 40-50 males. I have traded a few specimens with collectors. I can say that this large species of saturniid (from time to time) exhibits some of the worse greasing imaginable. Under normal circumstances, I have found that if the specimen does not grease up badly before 4 months than it will probably be a keeper. Otherwise, forget trying to de-grease these and just catch some more next year. This beautiful species is truly the "highlight" of any trip I make to Southern Illinois. They are surprisingly strong, somewhat pungent smelling, and can be kept alive as pets for 3-4 months so long as you provide them peach slices ! The spotting on the wing covers or "freckles" as I like to call them are unique to each individual. Also, the males vary quite a bit in size overall, as well as in the length of their 2 horns, and sometimes in the background color of green (with some individuals appearing a yellowish-green or blue-green). All of these varying things of coarse being the by-product of their food source (as larvae); as well as it's availability. I only find one or two specimens (if I'm lucky) on any given trip and females of coarse are what one finds most often. This trip netted me 3 individuals with an additional female not pictured. I am very interested in your arguments. I'm from Germany. What does look like your collection permit? 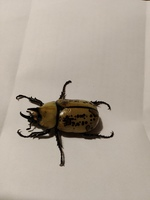 I am sorry scarabaeidae; I don't quite understand your question... Over here in the US we can collect just about anything insect related except of coarse maybe a dozen protected butterfly species and a very few protected beetle species. All else is pretty much fair game. 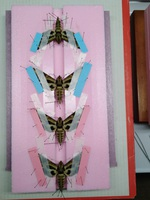 Lepidoptera are my main order of interest however, some Coleoptera families also peak my interest. The above species of Dynastine is found here in heavily wooded regions of Appalachia. In Southern Illinois there are many peach groves. These beetles love the rotting peaches sitting on the ground. The only problem is getting permission to walk about and collect on private property. I know of an area where I can set up a Mercury Vapor light (facing the woods) and manage 2 or 3 of these most any trip that I make. I normally manage to keep these native Hercules alive for 3 or 4 months minimum by just feeding them peach slices ! Hello Trehopr1. Thank you for your Message. OK, I write messages again. 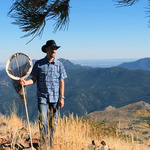 I was collecting the bugs in Colorado, but I do not own a collection permit. Nevertheless, I'm a little bit afraid of police or rangers, because many landowners have a complete fence system. So I do not know how to get there! I'm looking for a companion from USA or you can explain something to me. Thank you. Hello scarabaeidae. Generally speaking, the only time collecting permits are needed in the US is if you will be doing collecting activities in a well known Wildlife Refuge, a National Park, or a specifically protected fen (marsh) or prairie site known to harbor a protected species of butterfly. You would likely only get such permission if you had scientific credentials and your reasons were deemed rational (valid). Otherwise, those specific areas are all off limits ! Now, if you should go to a State Park (of which there are usually several in each state); than "technically" you are not allowed to collect their either. However, I have found such parks generally have far fewer staff to man them. And unless, you run across some ranger who takes their job a "little too seriously" or you bring some overt attention to yourself with your activities; than you will likely not be bothered by anyone. No one generally cares. The rangers in those parks have got enough to do looking out for intoxicated patrons, speeders, and other obnoxious activities. At the worst, a disgruntled ranger may ask what you are doing and that you need to do it elsewhere (as a warning). Otherwise, there are plenty of open spaces and forest areas (not manned by the state or government) where one can freely collect and never be bothered by anyone or anything. If you are collecting in Colorado, any of the many 'National Forests' are open for collecting. You should not have trouble if you target those. 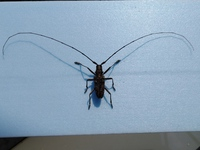 For those readers who are fond of beetles and especially longhorn beetles (Cerambycidae); here is a somewhat rare find which I picked up recently (June.30.2018) on my trip. what these grand fellows spend much of their lives living in as larvae. antennae measure 143mm. across (tip to tip). It's body is approximately 14-15mm. This is only the 2nd time that I have ever found one of these in all my numerous trips collecting in that area. It is a mighty special find and worthy of mention. 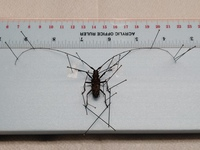 That is probably a Monochamus notatus. Could you send me an enlarged photo of elytra! 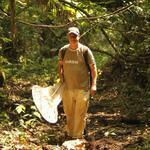 I just migrated from InsectNet and joined the forum here, and figured I'd start contributing by helping out here. I would suggest that this is Monochamus titillator. 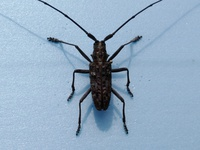 Monochamus notatus is more northern in distribution (but might be in southern IL) and more evenly colored gray. The image is a bit dark, but from the length of the antennae, I believe this is M. titillator and not M. carolinensis. 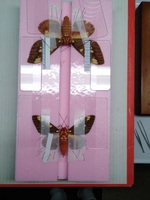 A closer pic of the elytral apices would clinch it - notatus has rounded sutural angles; titillator and carolinensis are spined, but in titillator, the apices of the elytra meet the suture at a right angle, and this is obtuse in carolinensis. And here he is again after removal of the bracing pins! 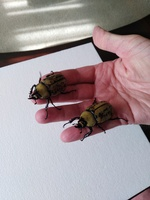 I love these fellows... Finding one is rather like finding the "Batocera" of North America -- so to speak. Remarkable creatures.